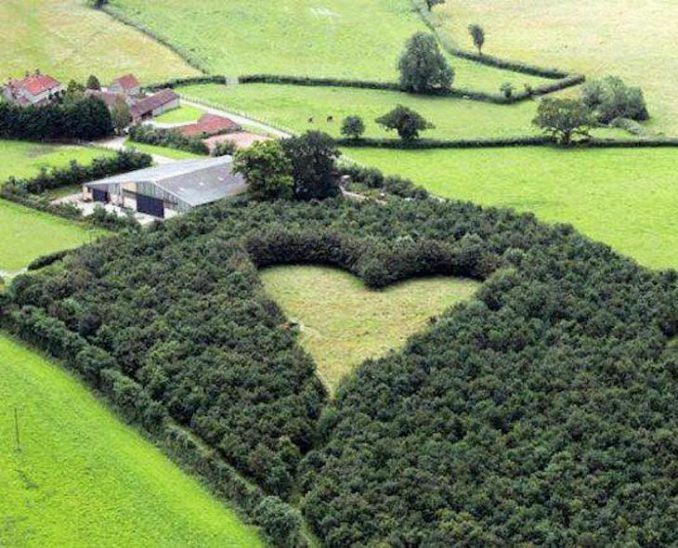 A man planted over 6,000 trees to honor his late wife, but there was much more to the story. For a decade and a half, the husband’s secret was kept hidden until a pilot flew over — and he could not believe his eyes. Now, aerial photos have revealed the widower’s true motivation. 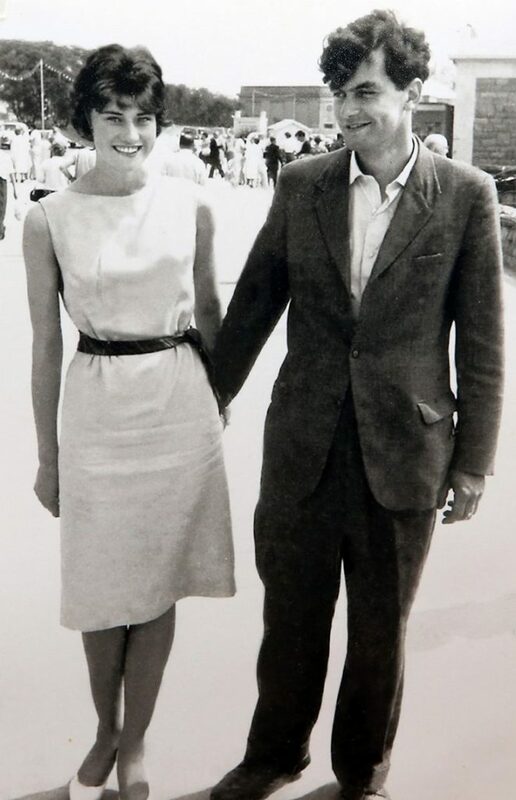 Winston Howes loved his wife Janet. In fact, it was love at first sight for the soul mates, which only grew stronger with each passing day. After marrying in 1962, the couple moved into a charming farmhouse on 112 acres in the English countryside, where Janet gave birth to their son a short time later. Over the years, Winston and Janet came to share a bond that most only dream of. Not only was their relationship strong, but their son was healthy, their farm flourished, and life was perfect in their Wickwar, Gloucestershire, dream home for over three decades. 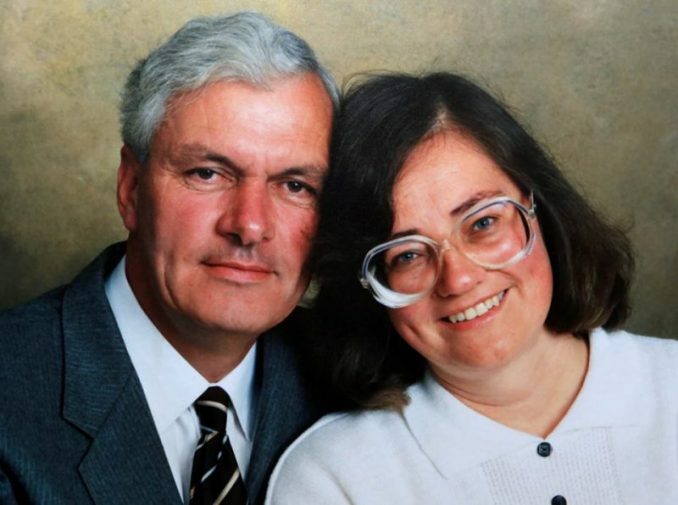 Then, Janet suddenly passed away after 33 years of marriage when she unexpectedly suffered heart failure at just 50 years old, leaving a grief-stricken Winston behind to mourn the loss of his beloved wife. He felt his entire world collapse at that moment. The woman he had loved so much for so long was gone. Winston was devastated, and no matter what he did, Janet’s departure seemed too much to bear. Then, months after her passing, Winston was struck by an idea. Even though he could never bring back his beautiful wife, he could honor her with a beautiful gesture of everlasting love. So, the British farmer got to work in a field near the home they had shared for so many years. Wanting to create a private, sacred place where he and his son could visit on difficult days, Winston began planting trees — a lot of trees. But, there was more to his plan than initially meets the eye. When his work was done, Winston had fulfilled his goal, but the true motivation behind his work remained a secret, hidden in plain sight among the trees. Then, 15 years later, a hot air balloonist flew over the meadow. Pilot Andy Collett was on his way home on a beautiful afternoon when he looked down and was left stunned by what he saw. He had discovered Winston’s tribute, revealing the reason the widower had painstakingly planted thousands of trees. 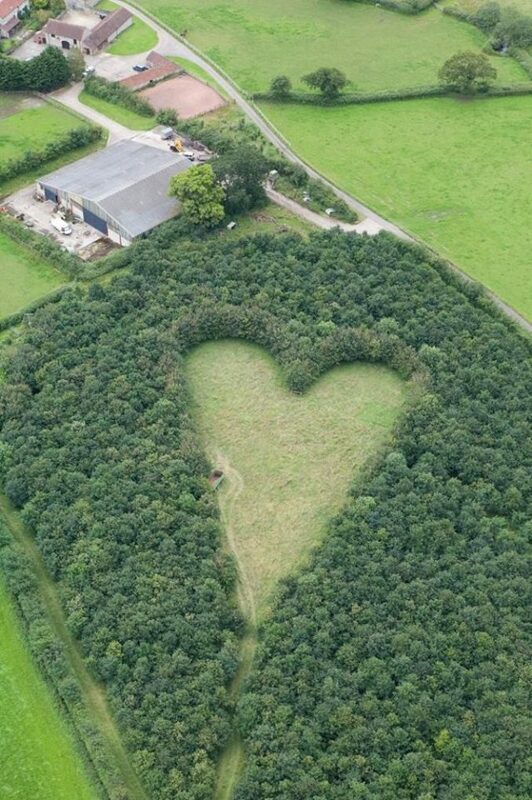 In honor of his beloved Janet, Winston had created a forest with a clearing in the shape of a heart. But, there’s more. 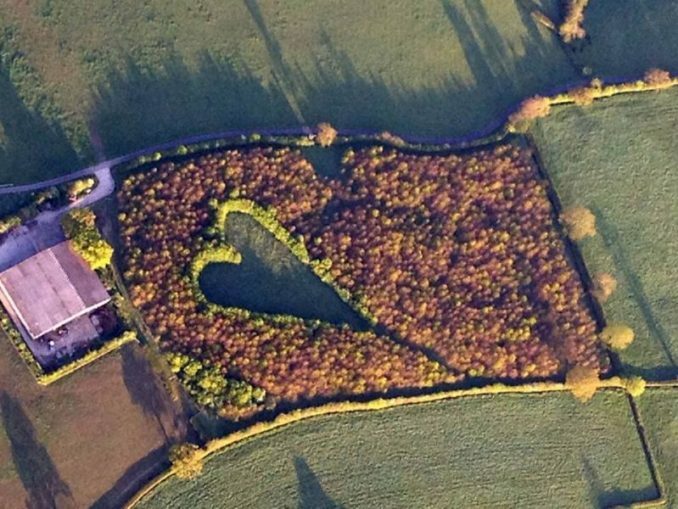 Winston’s stunning memorial was his very own secret garden for years until Andy happened to cruise over the land and capture a picture of the giant grassy emblem, according to General Knowledge & Interesting Facts. Although Andy had never met Winston and had no idea why the heart was there, he assumed that there was a love story behind it. “I have my own balloon and am quite a regular flyer — but this was the most amazing sight I have ever seen from the sky. It was a perfect heart hidden away from view — you would not know it was there. You can just imagine the love story,” Andy told Daily Mail, describing how he felt when he flew over the heart. “I thought it was a great idea — it was a flash of inspiration — and I planted several thousand oak trees. Once it was completed we put a seat in the field, overlooking the hill near where she used to live,” an emotional Winston said of his labor of love as he revealed why he planted the trees in the 6-acre field and the little details behind this heart-shaped forest and memorial meadow that moved thousands of people. The green-thumbed romantic planted large oaks around the edge of the heart, which points to the village of Wotton Hill, Janet’s childhood home. He built a hedge around it, too, and every spring, daffodils bloom in the center. Winston’s tribute to his wife is the perfect place for him to remember her. “I sometimes go down there, just to sit and think about things. It is a lovely and lasting tribute to her which will be here for years,” he said. Although nothing can bring Janet back, Winston can rest assured that she would love the heart-shaped meadow that was made just for her, and he will be able to tell her all about it when they meet again one fine day. I have a feeling heaven might look a lot like the place he created for his beloved bride. Losing a loved one, especially a spouse who you’ve built your entire life with, has to be a pain like no other. It’s inspiring to see how one man was able to channel that grief into something positive, ensuring that his wife will be remembered for years to come. Good can come out of tragedy. We just have to wipe away our tears in order to find it — just like Winston Howes did for the love of his life, Janet.